Wellness Complete Health Natural Dry Dog Food, Chicken Recipe, is healthy, natural dog food for adult dogs made with carefully chosen, authentic ingredients for everyday health and provide an optimal balance of nutrient-rich whole foods to fulfill the unique health needs of your dog, providing whole-body nutritional support to promote complete health. 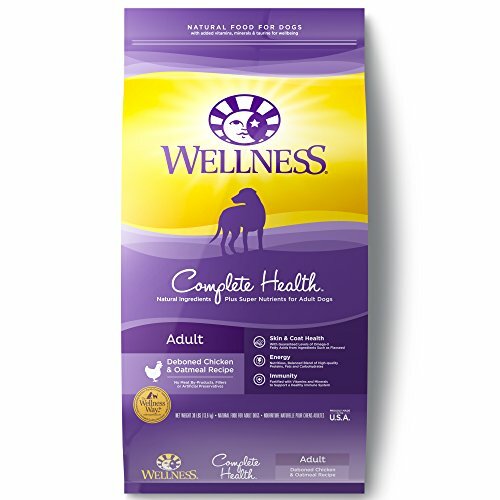 Wellness Complete Health Dry Dog Food supports your dog's balanced natural nutrition, healthy body mass, overall health and vitality, optimal nutrient absorption, bone and joint health and digestive health, all with natural and delicious ingredients to provide a guaranteed great taste that dogs love. Dogs over 125 lbs (57 kg): Add ¼ cup (30 g) per additional 10 lbs (4.5 kg). Combination Feeding: If feeding with Wellness wet food, reduce dry amount by ⅓ cup (40 g) for every 6 oz (170 g) of wet food. Every dog is a little different, so optimal feeding amounts may vary with age, size, activity level, breed, and environment. Please use feeding guidelines as an initial recommendation and adjust as needed. Calorie Content: This food contains 3,619 kcal/kg or 434 kcal/cup ME (metabolizable energy) on an as fed basis. Since Breeder's Choice began in 1947, we've been uncompromising in our pursuit of the healthiest nourishment for the pets we love. Our commitment means we use only high quality natural ingredients, with vitamins and minerals, carefully chosen and meticulously cooked for complete and wholesome nutrition. We balance our formulas to provide optimum nutrition for your pet's health and protection. This is what we call the Pinnacle Holistic Difference. The three excellent natural sources of protein in Pinnacle - chicken, oatmeal and the organic quinoa seed - provide the building materials for your dog's strong muscles. The oatmeal and organic quinoa seed, along with fresh potatoes, are unsurpassed sources of the complex carbohydrates that give your dog energy. Energy also comes from high quality sources of fats rich in omega 6 and 3 fatty acids for a healthy coat and skin. 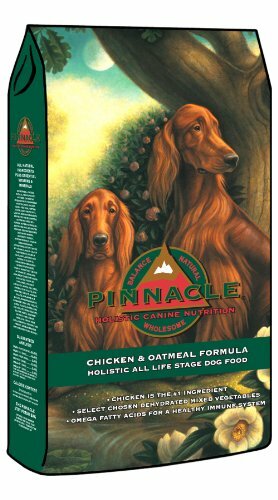 And a wide range of nutritional elements on which your dog depends for disease prevention and continued robust health come from the assortment of vegetables in Pinnacle.